What happens to all that spare change you have from your purse, pockets, jackets, and car? What do you do with it? Does it just accumulate, and never really help you again? Here’s how to make that change work for you. I remember back-in-the-day my mom keeping a ‘penny’ jar in the pantry. Every week as my mom cleaned her purse, she dumped into the jar and any time we needed milk money for school or for the football field nights, we grabbed from the jar. Later in life, one of my friends amazed me with the bowl they kept of change it was a huge mixing bowl and it took up an entire tabletop. Funny thing about the change in that home, they were all wanting to use it to buy stuff but no one wanted to wrap it up for cashing in. The job of wrapping up spare change was a tedious, time-consuming job that while it resulted in a nice yield of cash, the price of time spent wrapping made it a job everyone passed on! Jingle Jingle I can tell them how they could have made that spare change tingle and then lavishly live money out loud, are you ready for this? My great find this season is Coin Star. I will say my first attempt at using it was not so successful, only because the first stop at our local Coin Star had a broken machine. That did not stop this coin-packing maven, I sought out the next location and guess what —- Whoever coined the phrase, “Necessity is the mother invention” hit it the coin on the face(lol). While coins are great and they spend, carrying them around is a rather heavy job and in reality coins are better when you add them together to get crisp clean dollars. Invention: Coinstar! Coinstar is the one stop sensation that will take that jingle and make it tingle and transform into cold hard cash, PayPal funds, Prepaid Cards, No Fee ECertificates and donations. Make your change work for you and remember that with Coinstar, “every penny counts” towards your Cash Voucher, No Fee eCertificates, etc.! Ca-ching! Free or Fee You Choose! Coinstar cashouts do cost you money(10.9 cents on each dollar) but it can be free depending how you use it to cash in those coins. In reality you are costing yourself money if you have spare change sitting in your ashtrays, cup holders, purses, backpacks, sofas and desk drawers because you are not using all the spending potential you have. Gather that loose change up and any dollar bills, then head to your local Coinstar Center® which may be closer than you think as they are located in more than 19,000 supermarkets, drug stores, mass merchants, convenience stores, financial institutions and restaurants. I know that our Giant Eagle is open with long hours so my coin cash-in fun can happen late into the day, so I never have a worry about timing and many of the other locations are the same(just check store hours). 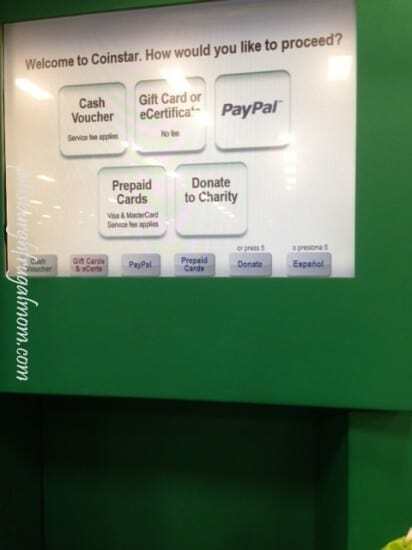 I spoke to a man today at the Coinstar Center emptying margarine containers of coins and I asked him which options he used, gift cards, cash, or donations and here is what I found out! The gentleman told me that he works at a church and all the loose change is collected for the kids and put towards all of the things they do, so the cash out that costs him 10.9 cents on every dollar is worth it because they need the cash. He did tell me that he wished the Coinstar Center offered grocery store cards so they could fill up the pantry with things they needed and snacks for the kids as well! I think that is an outstanding idea! Thanks to this man for his insight and as you can see Coinstar means something different to everyone who uses it. 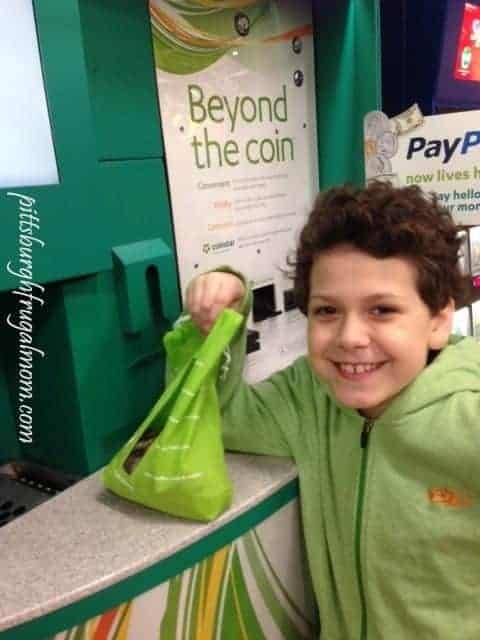 You are prompted what to do at the Coinstar Center, and it is very easy to use, the hardest work is gathering up all that spare change and hauling it into the store! Remember many of the Coinstar Centers accept dollar bills too, so if you have a stash, add them in! We actually stood in a line, and the guy in front of us had a shoebox filled with change!(eyeroll). You don’t want to pay a fee! My answer to you is quite simple: eCertificates and Gift Cards. Every last penny you put into the Coinstar Center funnels right into those eCertificates and Gift Cards to great stores that vary by location but may be: Nike, Chili’s, Starbucks, Southwest Airline, Lowes, JCPenney, Sears and so many more! The gift cards and eCertificates are paper receipts that have a code on them and they work exactly like a plastic gift card, so use them in store or online! We actually received a gift card for Starbucks and a eCertificate(receipt-like paper) for AppleBee’s. I know you are wondering if there are fees associated with using Coinstar and in all honesty I can tell you there are, but not if you use Coinstar in a way to make your Christmas shine while converting those shiny coins to eCertificates. This will get you around any fees you might pay on cashing in. 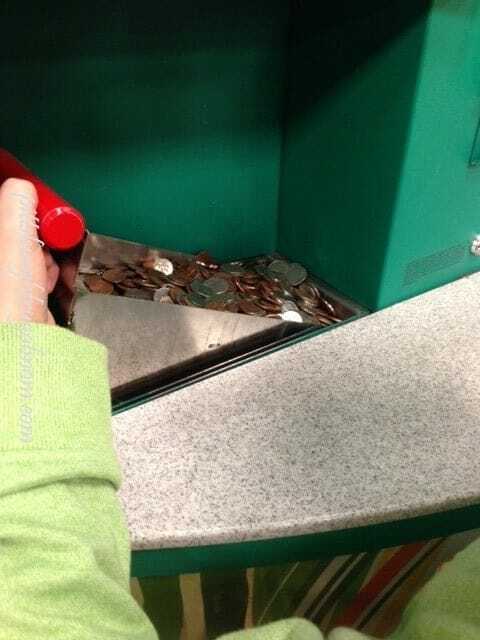 You Don’t Care If There Is A Fee You Just Want To Convert Your Buckets Of Change To Dollars! Get there and pretend you are at the slots in Vegas, but this time you are filling the change up, rather than having the change pour on you when you win! Get ready to clink, chink, and collect on those coin stashes as you dump your spare change and receive a Cash Voucher that you cash in at the customer service desk(in store) for Cold Hard Cash. Turn your spare change into great holiday gifts with all that change you have collected that was scattered around your house! Those chimes you will hear won’t be Christmas Bells rather it will be the change you have clinking to cash out and add up into great spendable funds! Get the Jingle back into your holidays and a happy holidays to you & that is how to lavishly live the holidays with a bit more jingle and sparkle. I found this to be a great FIND and loved changing my cents into dollars, I hope you find it useful too!